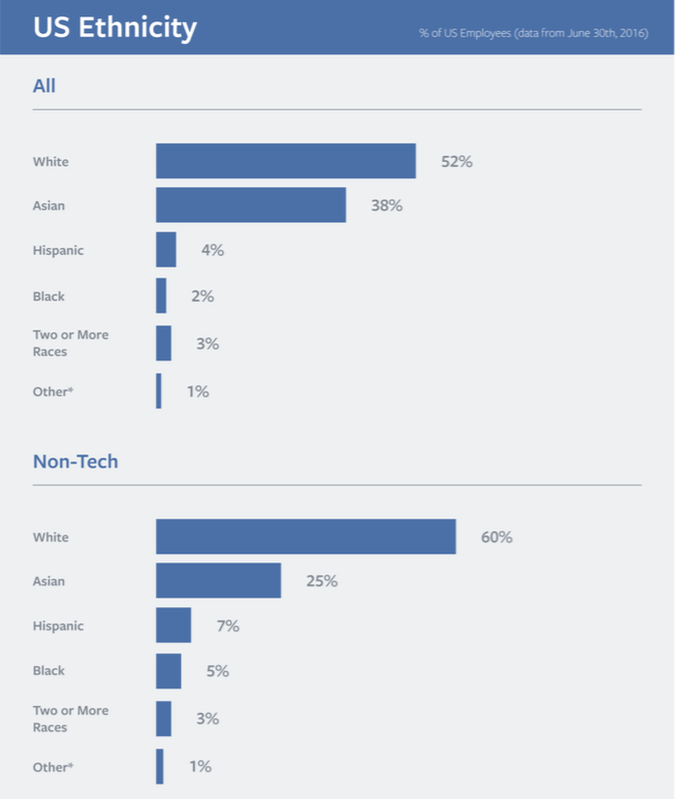 Facebook’s latest diversity report is a lot more of the same, with the exception of two components: LGBTQA employee representation and hiring data from the last 12 months. Facebook also announced a $15 million investment in Code.org to help the non-profit organization develop computer science curriculum among underrepresented student populations. Here are the high-level stats. Facebook is 52% white in the U.S., compared to 55% white last year. That should be good news, but it’s more so bittersweet because there was no increase in the two most underrepresented groups at Facebook: black and Hispanic. Facebook’s employee population in the U.S. is still only 2% black, 4% Hispanic, 1% other and 3% two or more races. There was, however, an increase in Facebook’s Asian population, which went up from 36% to 38% this year. Globally, Facebook employs slightly fewer men. As of June 2016, Facebook is 67% male compared to 68% male last year. For the first time, Facebook disclosed data around sexual orientation and gender identity via the results of a voluntary survey. Of the 61% of employees who responded, 7% identified as LGBTQA (lesbian, gay, bisexual, transgender, queer or asexual). Although these numbers make it seem like not much has changed, 9% of Facebook’s new hires over the last year in senior leadership roles were black, 5% were Hispanic and 29% were women. The hiring rates of blacks, Hispanics and women exceed their current respective representation at Facebook. “What we’re starting to see is that our hiring trend is going in a positive direction,” Williams said. Facebook, of course, cites the pipeline as a problem for the reason why there are not more hires from underrepresented groups. Williams pointed to how only one in four high schools teach computer science and in nine states, zero black people took the Advanced Placement Computer Science test last year. That’s why Facebook has committed $15 million to Code.org over the next five years to focus particularly on underrepresented people. The hope is that investing in Code.org will help to beef up the pipeline of underrepresented students moving into the tech industry. Though, the Equal Employment Opportunity Commission has raised its eyebrows at this so-called pipeline problem in the tech industry. Back in May, the EEOC said that the tech industry is underutilizing the diverse talent pool it already has. This diversity report comes at a time when our country is in turmoil — a state of unrest around the systemic racism that results in the death of black people at the hands of the police. Williams and I chatted about the news of the last couple of weeks and how systemic racism plays into Facebook’s overall diversity and inclusion strategy. Noting how Facebook CEO Mark Zuckerberg visited San Quentin last year to see first-hand what the conditions are like, Williams went on to say that Facebook has been “interested in the racism — the web of racism that researchers like Michelle Alexander (author of The New Jim Crow) have exposed that may underlie the system that makes it so people are disproportionately negatively affected — black and brown people.